The Blue Valley neighborhood is located on the east side of Kansas City, organized in 1976 with boundaries of 12th Street on the North, 40 Hwy on the South, Van Brunt Blvd on the West, and I-435 on the East. This neighborhood has suffered from years of decline and neglect. At the bottom of the page are links to the Blue valley Neighborhood Association and information about the Blue Valley Neighborhood. Boarded up houses are common along with city owned vacant lots that are overgrown and subject to illegal dumping. Most of the houses are small one and two bedroom which makes them unattractive to the investor community. Homes this size are difficult to rent as most are looking for houses with three and four bedrooms. Boarded up and vacant homes have sat for years. Working in conjunction with Legal Aid of Western Missouri , Blue Valley Neighborhood Association and Land Bank of Kansas City, we identified the south side of 27th Terrace between Van Brunt and Oakley as a real opportunity to make a difference in the neighborhood. A total of six single family homes and three vacant lots were deemed abandoned and available for purchase and renovation. 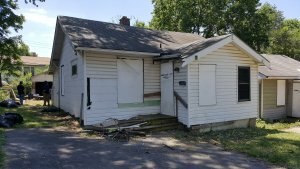 One of the homes were donated, four houses and three vacant lots were purchased from the Kansas City Land Bank and one home is abandoned and we are in the process of acquiring it through the Missouri Abandoned Housing Act. 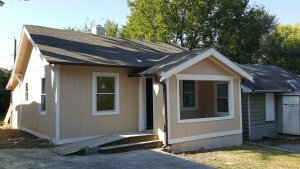 Before and after pictures of our first house at 5443 E 27 Terrace. This house was a total renovation to include new roof, siding, windows, electric, plumbing, drain lines, furnace, hot water heater, updated kitchen and updated bath. We also added new carpet and floor tile, mini blinds and ceiling fans. This project is now complete. When we first previewed this block we found overgrown lots filled with trash, tires and overgrown grass and trees. Squatters, prostitution and drugs house were ever present. Now this once neglected crime and trash filled block has four new owner occupants from our purchases, two new owner occupants who purchased and renovated two other Land Bank properties, a boarded up apartment building has been renovated and fully rented. The drug houses are gone, the squatters are gone and so is the crime they bring with them. Our vacant lots have been cleaned up and maintained and are awaiting future development.